Okay, this week's title is a bit of a stretch ... but just like there were three kings ... we want to see three (or more) different pieces of patterned paper in your card design this week. They can all be the same company ... even the same collection ... or you can totally mix-it up ... but we want to see three different patterned papers in your design. And joining us for this week's prompt is a wonderful sponsor who specializes in fabulous designer papers ... Nikki Sivils Scrapbooker. 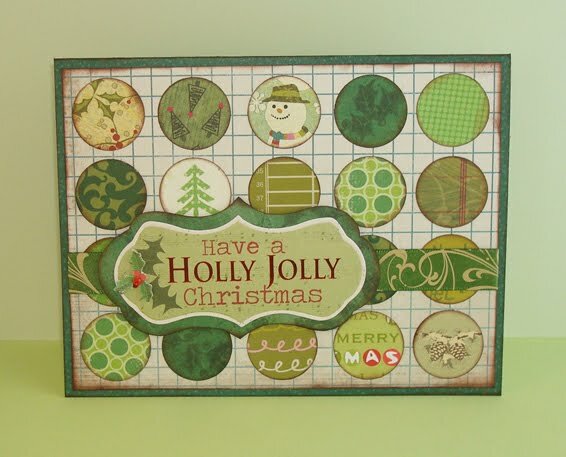 She has graciously donated a 6x6" pad of her Happy Holly-Days paper, as well as several 12" sheets including stickers and die cut shapes to one lucky participant this week. We are also thrilled that the very talented Julie Tucker-Wolek is joining us as a Lovely Guest Star this week. Julie is a member of Nikki's Doghouse Diva's Design Team. She can also be found on her blog Life with the Tucker & Wolek Clan. 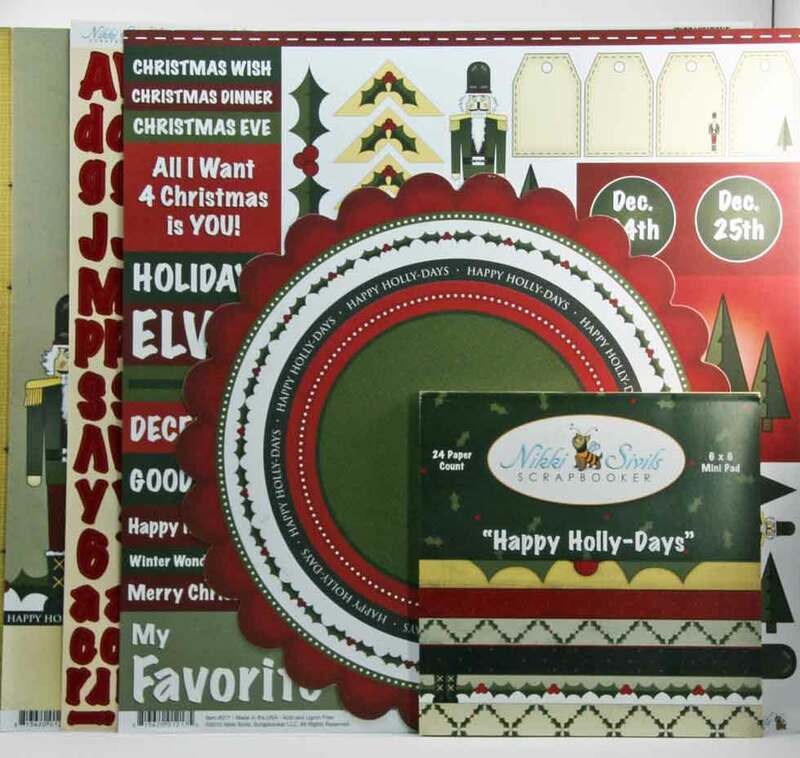 Julie says, "My card combines papers from three different lines from Nikki Sivils Scrapbooker ~ Beatrice, Happy Holly-Days, and North Pole Nights." 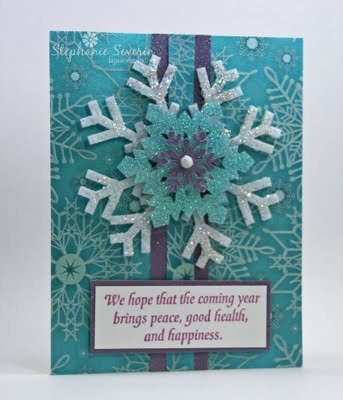 Stef says, "I used one paper from My Mind's Eye (the polka dot base) and three more from Echo Park's Wintertime Collection. 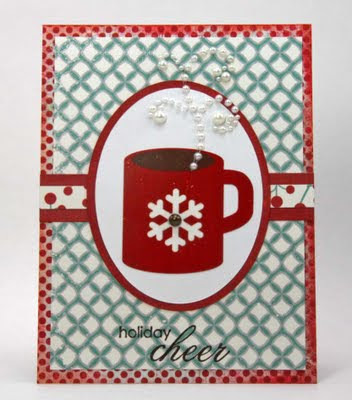 The hot cocoa mug sticker is from Echo Park, and I added a pearl Flourish for some steam. 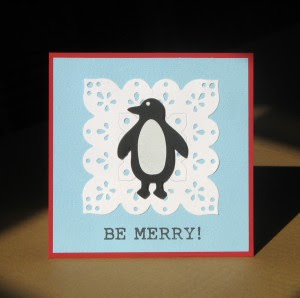 The sketch is this week's CPS & sentiment is Penny Black. Now it's time to see what you can put together with your patterned papers ... maybe you'll break into some new ones ... or maybe you'll go through your scraps and see what inspires you ... whatever you do, have FUN ... and make sure you incorporate three (or more) different patterned papers. Use keyword JB22 if you upload to a gallery or the jingle belles flickr gallery ... links close at 6pm EST on Wednesday, June 1, 2011.
amanda says, "I loved how whimsical this card is. The little mouse image is darling and the coloring is perfection! 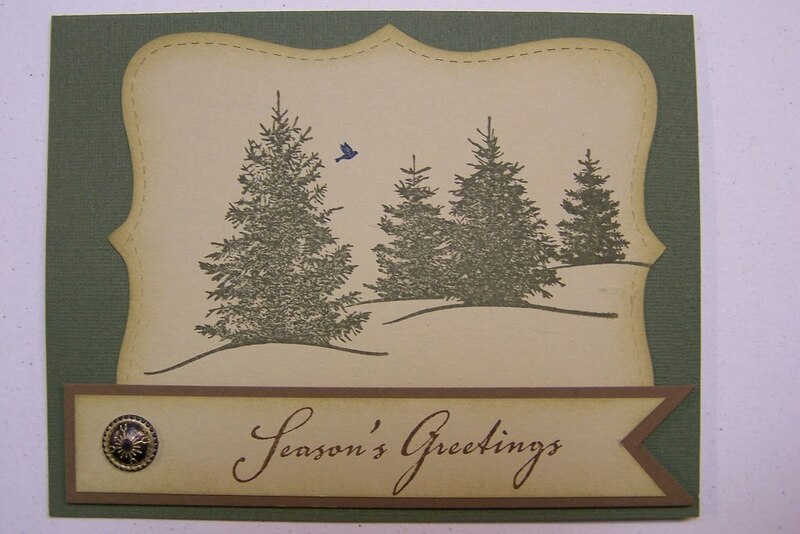 Besides the beauty of the card, 'Not a creature was stirring, not even a mouse!'" amanda says, "All I have to say is, 'Holy adorable stocking hanging off a pleated flower made of sheet music!'" I love this, a lot. The soft colors and the design of all the embellishments is drool-worthy. A beautiful vision of sugar plums!" amanda says, "I am a CAS gal, so this card won my heart. I love the little charm she added to the snowflake and how the word "sugar" is literally coated in sugar! Brilliant! The card has the perfect amount of purple 'pop'!" our sincere appreciation and congratulations to everyone who took part this week, as usual we are BLOWN AWAY by your amazing creativity!!! an extra-special helping of thanks to our lovely guest star amanda profumo, and her extraordinarily talented fellow card makers elan and anna; we hope they have enjoyed this week as much as we have! We hope you've had a chance to check out amanda's blog & etsy shop to see more of the profumo family's work! 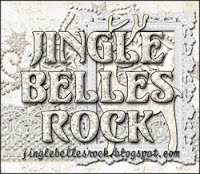 hello ♥JINGLE BELLES♥! this week we're super-excited to be joined by lovely guest star amanda profumo! amanda is the crafty mom of three adorable kiddos; who, by the way, are already crafty in their own right--more on that in a minute! amanda delights us on a regular basis with the amazing creations she posts on her gorgeous blog crafty paper girl, and her etsy shop of the same name makes us swoon with shopping fever! 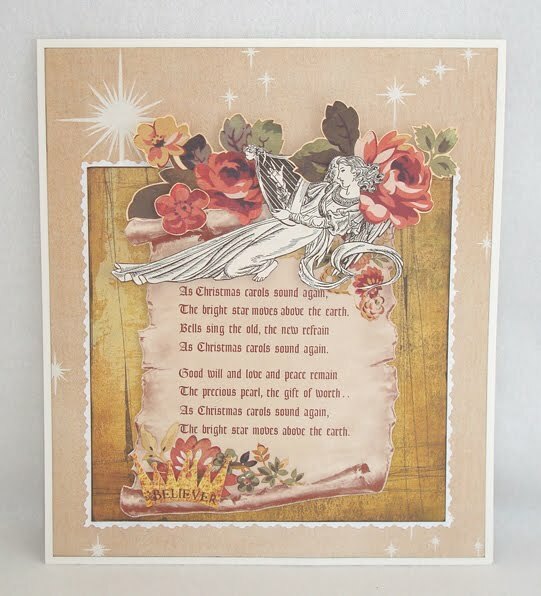 amanda was inspired by this luscious style board she found on one of her favorite blogs, paperdoll romance, and thought it could lead to some rather fabulous christmas cards so she emailed us (at jinglebellesrock @ hotmail [dot] com!) and of course we agreed wholeheartedly that for this week's prompt we should all have VISIONS OF SUGAR PLUMS! 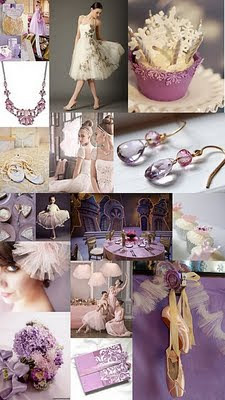 Amanda says, "Mostly, I was inspired byt the sugar plum color and the bottom right corner of the inspiration board. That's where my idea to do ice skates instead of ballet slippers was born! 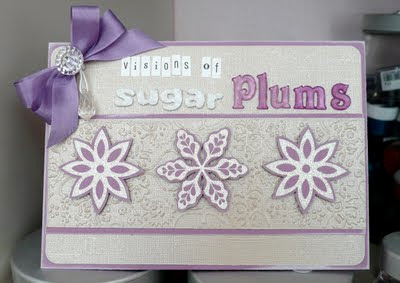 When I think of sugar plums, I think soft purples and coarse glitter! YUM!" as noted above, amanda's two eldest children, elan (aged 4) and anna (aged 6) are avid crafters. so much so that when they saw their mama's beautiful creation, they were inspired to make their own versions! cleverly they've both already learned that the best shortcut is to scrap-lift from someone you admire; being artists, of course they put their own twists on the design! elan (whose favorite tool is the cuttlebug) liked the button and pompoms in his mom's card, but elected to use his favorite color--orange--for the socks. anna (who is already quite a stamping queen) kept her card monochromatic, but swapped out some glamorous snaps for hangers, and purple gems in lieu of pompoms. and now i think we can all rest easier knowing the future of card making is in safe hands! feel free to stop by amanda's blog and leave a little love for the next generation of JINGLE BELLES (& BEAUX)! 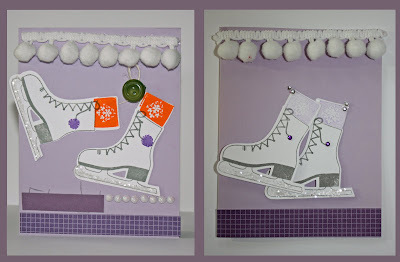 Stef says, "I was inspired by the glittery purple & white snowflakes, as well as the tiny bit of blue peeking through at the top of the toe shoes photo. I covered a felt die cut snowflake with a serious coat of Stickles glitter glue (smearing & dabbing it on with my finger) and then layered on more snowflakes. 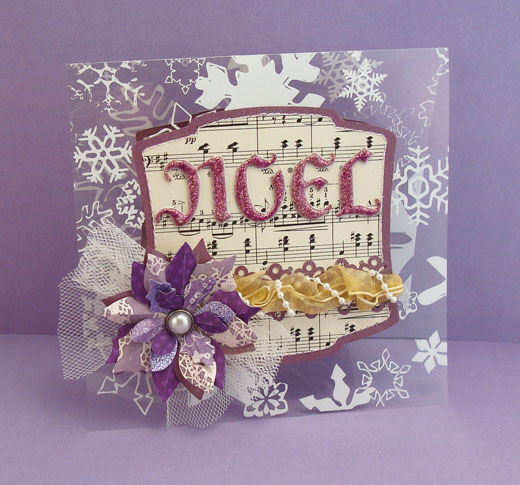 The background is covered in velvet snowflakes, so this card has both texture and glitter. The sentiment is from Judikins and usually finds itself on the inside of my holiday cards ... but today it's front & center." Lauren says, "i was inspired by the various shades of lilac, plum, gold and white in the style board, and also by the beautiful flowers and ballerinas. i was hoping to use an image relating to the nutcracker ballet, but couldn't find anything i loved, so i went a little more "symbolic" instead by incorporating tulle and some vintage sheet music. i tried a bunch of different card bases before i settled on this hambly transparency, which i think really MAKES the whole thing!" and now it's time to see what YOU will do with the phrase... and the inspiration photo... VISIONS OF SUGARPLUMS! get out your glitter or snowflakes or purple papers or ballet-inspired goodies... or all (or none!) of the above; be bold, be creative, but above all: HAVE FUN!!! link up by 6pm next wednesday, may 25th at 6pm, EST. the code for SCS or flickr is JB21. enjoy! We loved all of the fabulous Santa-themed cards this week ... looks like no one was on Santa's naughty list (at least this week). 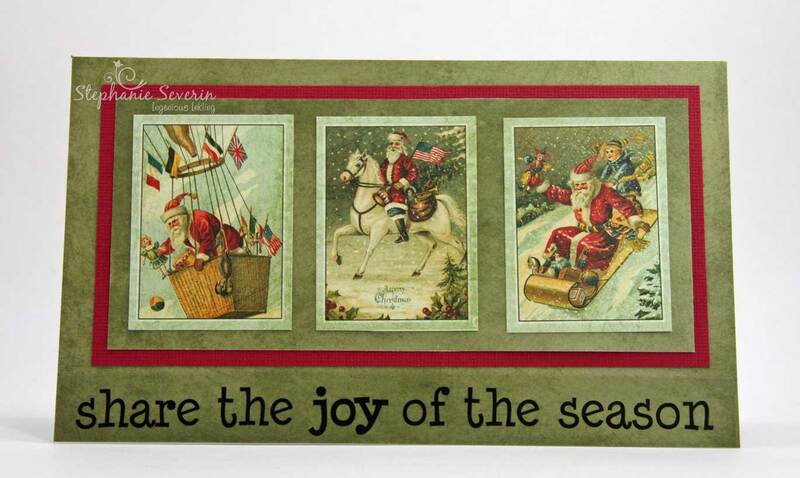 Here are a few of our favorite jolly cards. fabulous glittery sparkle ... love his nose like a cherry. Candy - send us an e-mail, so we can get your Lovely Guest Star spot scheduled. And, if you've not yet done so, we strongly encourage you to scroll down to the thumbnails in the last post and spend a bit of time seeing your fellow ♥JINGLE BELLES♥ in action! then come on back at midnight when the NEW prompt goes live! This week we're celebrating Jolly Old Saint Nicholas by creating cards that feature Santa Claus. And for Friday the 13th, we decided to make it someone's Lucky Day (and hopefully make them a little Jolly) ... one random cardmaker in this week's prompt will be chosen to be a Lovely Guest Star for a future Jingle Belles prompt. 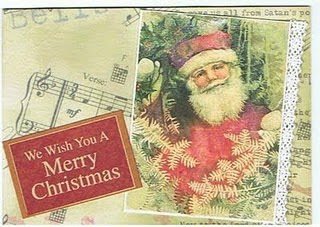 Stef says, "These fun little Santas were cut from a piece of Pink Paislee Father Christmas Designer paper. 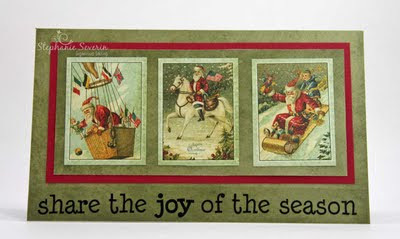 I thought the sentiment was perfect since each one looked like he was having a joyous good time ... and I had enough Santas left from the 6" square of paper to make several more Santa designs." 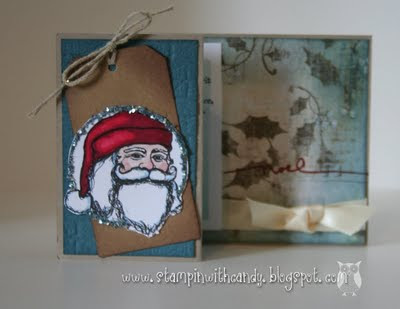 Lauren says, "this adorable echo park santa journaling tag was leftover from my november pixie dust paperie kit, and i honestly wasn't sure he was big enough to build a whole card around... but it was too cute not to try! i popped him into an ancient making memories frame, added stickers, rub-ons & flowers, and matted the whole thing a couple of times and whaddaya know? i've got a full-sized card! that seems pretty lucky... and rather jolly... to me!" Now it's time to see what you will do! Dust off your thinking caps and your Santa hats and give us your jolliest cards that feature Father Christmas, Saint Nick, Sinterklaas, Pere Noel, or good old Santa Claus! As always, Inlinkz will remain open until 6pm (EST) next Wednesday, May 18th; the code for uploading to SCS or Flickr is JB20. Please link the SPECIFIC BLOG POST which contains your card and NOT YOUR WHOLE BLOG! Thanks! 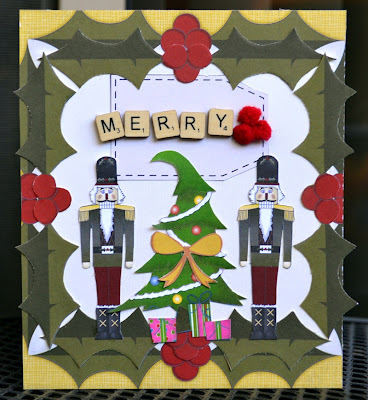 the spirit of christmas past prompt seems to have been particularly inspiring, and here are a few cards that embraced the vintage vibe in especially cool & original ways! proved definitively that vintage style and "clean & simple" are not mutually exclusive concepts, and that an elegant monochromatic design can have loads of nostalgic charm! showed us that modern technology and old-fashioned beauty can be perfect partners by pairing a gorgeous digital image with "real life" supplies like that fabulous paper lace! went all out with old, new, and vintage bits from her stash to create this uber-charming eclectic masterpiece that has holiday style enough for any era! Since we've already celebrated the ghost of Christmas present ... this week we're celebrating the Spirit of Christmas Past. We're asking you to create a card celebrating all things vintage. It could mean incorporating true vintage elements ... or just a vintage style ... whatever says "vintage" to you. 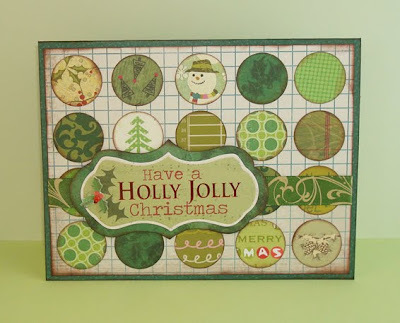 Stef says, "I have lots of stickers and chipboard from Crafty Secrets that have been in my stash much too long ... 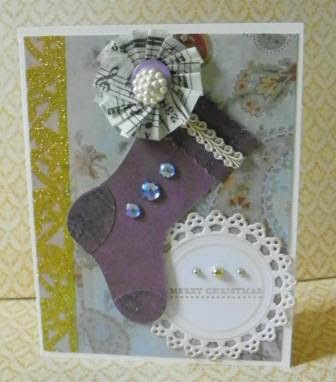 I was so thrilled to use some of those wonderful vintage items in my card this week. I attached the stickers to cardstock scraps and then cut them out, so I could attach them over the wrap of linen string using foam tape for dimension. 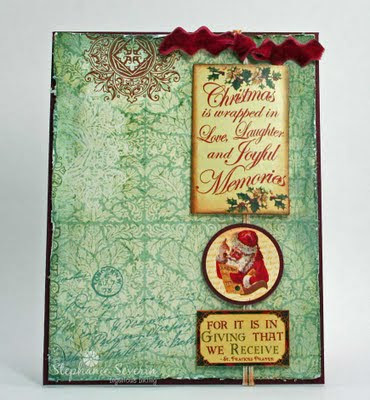 The wonderful paper is from the Pink Paislee Father Christmas Collection (distressed & inked with distress inks). I finished with a knot of velvet rick-rack for some vintage texture. The sketch is this week's Unscripted Sketch." 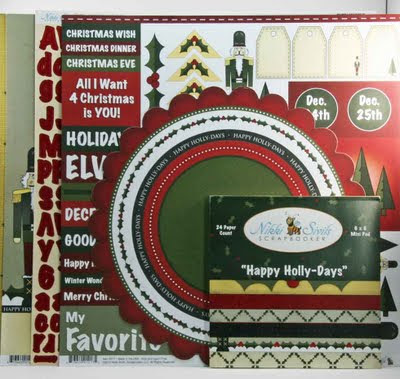 Lauren says, "i ♥LOVE♥ and collect vintage paper of all kinds, from postcards to magazines to maps; some of my favorite holiday card bits come from a stash of old ideals magazines that came from my uncle's mother. at first i had serious qualms about cutting into those, but part of what i like about them is the texture of the paper, and the fact that some of it has aged imperfectly making each piece unique. miss georgia was herself a clever crafty lady, and i THINK she'd be quite happy to see me making christmas card creations with her lovely mags! i've combined three separate vintage elements (the angel, the poem, and the starry background) with new papers and rub-on (by basic grey) on this card"
So relish all things vintage this week and show us how you embrace the spirit of Christmas past ... and use keyword JB19 if you upload to our Flickr Gallery or other gallery; inlinkz will be open until 6pm (EST) next Wednesday, May 11th. jess says, "I love that Kirsty added so much texture and interest with layering cardstock punches. 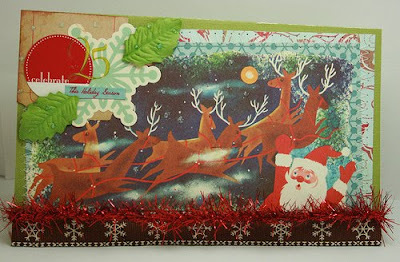 I also adore that Kirsty’s card has some untraditional colors but is still very festive!" 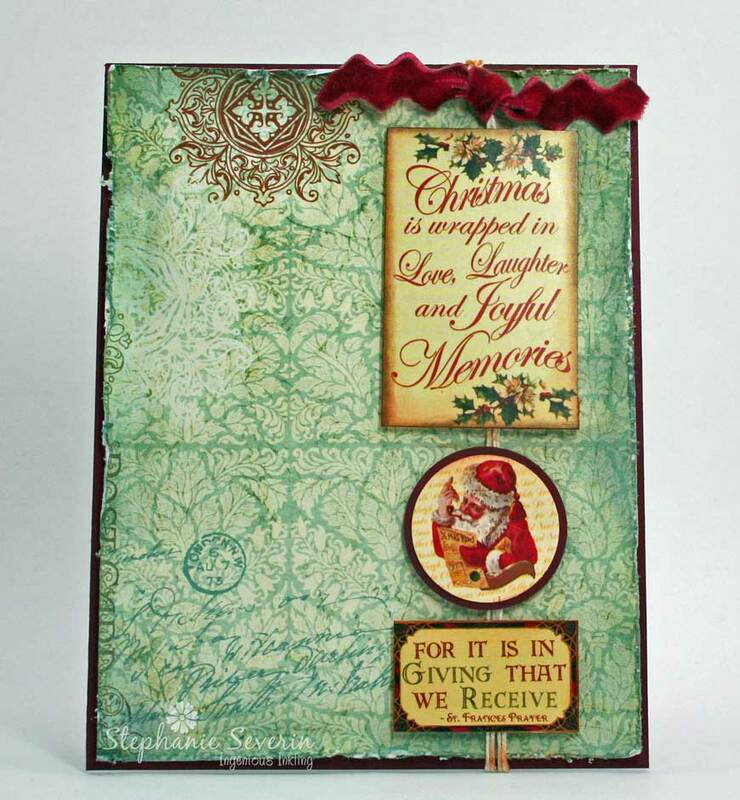 jess says, "A card without patterned paper lends itself to the CAS style and Jennifer captures that perfectly here. 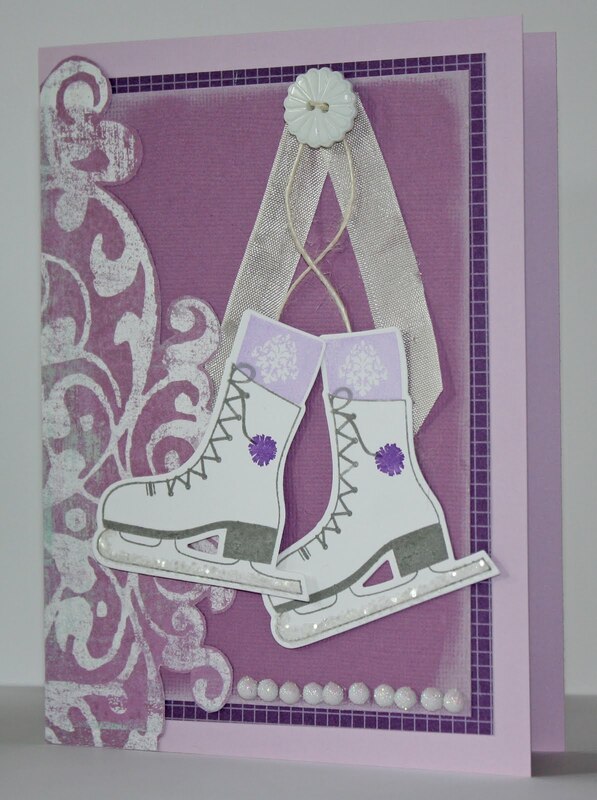 I love that her sentiment is simple and fun which goes so perfectly with her card!" 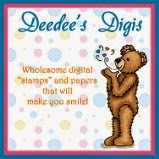 jess says, "I always admire individuals who can make fabulous creations with stamps. Kathe does an amazing job with this beautiful stamped scene. The thing that really got me about this card was the tiny touch of the blue bird which just makes the whole thing that much more beautiful and intriguing. !" speaking of jessica moyer, who came up with this excellent and challenging idea that sparked us all to think in excellent new ways, we'd like to take this opportunity once again to thank her for being our lovely guest star this week! we hope you've bookmarked out her very cool, very inspiring blog, Basic Jess, and that you'll continue to visit her DT gigs, Just Imagine/Kreaxions and Die Cuttin' Divas, where even more brilliant ideas can be found! please email us at jinglebellesrock @ hotmail [dot] com with your snail mail address so we can get those out to you poste haste!